For courses in Advanced Grammar. 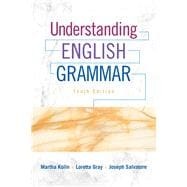 The acclaimed Understanding English Grammar fosters students’ innate language expertise as they study sentence grammar. It offers a practical blend of the most useful elements of both traditional and new linguistic grammar, beginning with an overview of English as a world language, language change, and various classroom issues associated with prescriptive grammar and correctness, along with an updated list of further readings. Every discussion is viewed through the eyes of a novice reader, bearing in mind how the current generation of students uses communication tools for social purposes. Both students and teachers appreciate the self-teaching quality that incremental exercises provide throughout the chapters, with answers at the end of the book. The Tenth Edition introduces new coauthors Loretta Gray and Joseph Salvatore—two respected scholars who bring their special expertise in linguistics and creative writing, as well as long experience in teaching grammar and writing. This title is also available with MyWritingLab –an online homework, tutorial, and assessment program designed to work with this text to engage students and improve results. Within its structured environment, students practice what they learn, test their understanding, and pursue a personalized study plan that helps them better absorb course material and understand difficult concepts. In addition to the full eText, activities directly from the text are available within MyWritingLab. These include the small scrawl written assignments, readings from the text, review exercises and more.